So far the excavations of Pompeii have provided us with around 1150 identifiable human bodies, 394 of which were discovered in the lower pumice deposits and another 650 were found above in the pyroclastic deposits. It is said that around 38% of the victims who began to flee Pompeii in order to survive were killed during their attempt to escape by falling roofs and collapsing walls as the weight of the pumice increased. Archaeologists were able to determine that 51% of the casualties discovered so far died inside the excavated buildings and 49% were supposedly outdoors at the time of their death. This image is of a cast that was killed during the eruption of Mt Vesuvius and is said to have been a slave due to the shackles around his ankles. He was within sight of the city gates when he was engulfed by the 4th pyroclastic surge that killed most of the casualties in Pompeii. The shackles represent slavery. Slavery was an accepted aspect of the daily lives of the Romans and to date there is no existing proof that slavery was ever questioned. Around 300,000 salves lived in Rome at the time of the eruption and participated in hard physical labor such as digging, mining and unloading goods. They were also used to cook, clean and craft. This image provides us with proof that slavery was a highly important aspect of Roman life as it is said that their empire grew to such a strong degree due to the large number of slaves that were imported from all around the world including Macedonia, Illyria, North Italy, Gaul and many others. The shackles represent the cruel behavior of a large amount of owners and the lack of freedom they were granted. This evidence of an actual remain of a slave frozen in time presents modern society with the concept of slavery used by Romans and is the explanation for the grand structures, advanced architecture and large amounts of roads, aqueducts and public buildings. If the eruption had not preserved this slave and others of his kind then Roman slavery would possibly not have been so well known as the war led by Spartacus, Crixus and Oenamaeus freed and recruited 70,000 slaves and was the cause of the fall of the republic due to the economic crisis that was caused by the lack of slaves. Slavery was officially abolished in the south of Italy arounf 189 AD. However it is also believed that slavery officially ended in (537 CE) caused by the laws of Justinian. This means that although slavery would have been spoken of and written about it would not have as great an impact on modern society as seeing a cast of a petrified slave from thousands of years ago. This cast provides us with evidence of slavery in the Roman world and portrays the constraint that they lived under. 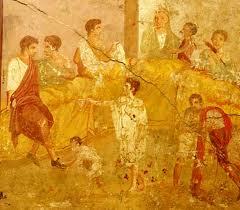 This painting depicts one of the common dinner parties that were hosted by the wealthy citizens of Pompeii. These dinner parties played an important role in Roman social life as guests were to recline on couches whilst being served food. What is interesting about this fresco however is the portrayal of the slave. The slave is seen in the fore ground of the composition but is depicted as much smaller than the other figures. This is because it indicates that they are of a lower status than the male figure whom appear to be enjoying them selves thoroughly. This images informs us that although slaves were not worthy of the same treatment that the rich were and were not blessed with the ability to dine with them, they were however an important part of Roman life. This is because they are actually seen in the image. If the slaves had been of no importance what so ever then they would not have been illustrated at all but because slaves meant wealth and status they were depicted. By painting the slaves smaller in size it symbolizes that their importance is minuscule in comparison to the wealthy men. This indicates that there was a true division of classes during the time of Pompeii and that the slave was poorly treated. This contributes to our understanding of the importance that the slave played in the lives of the wealthy but also depicts their place on the social scale. From this fresco we understand that the wealthy were aware of the slaves importance but were not interested in paying them respect because quite frankly they owned them and did not have to thank nor respect the slaves for the work that they carried out as it was socially encouraged. Without the preservation of this particular fresco we may not have understood the relationship quite as clearly between the slave and the owner. This image preserves the daily life of the slave and owner in a manner that represents both types of people in an almost respectable manner. My reason for believing this is purely because of the illustration of the slave at all. Even though slavery is something that has been recorded for generations this particular images pin points the work that the slaves carried out for the Romans before the destruction of Pompeii.